Crank up the heat with Camarones a la Diabla (Mexican Deviled Shrimp). 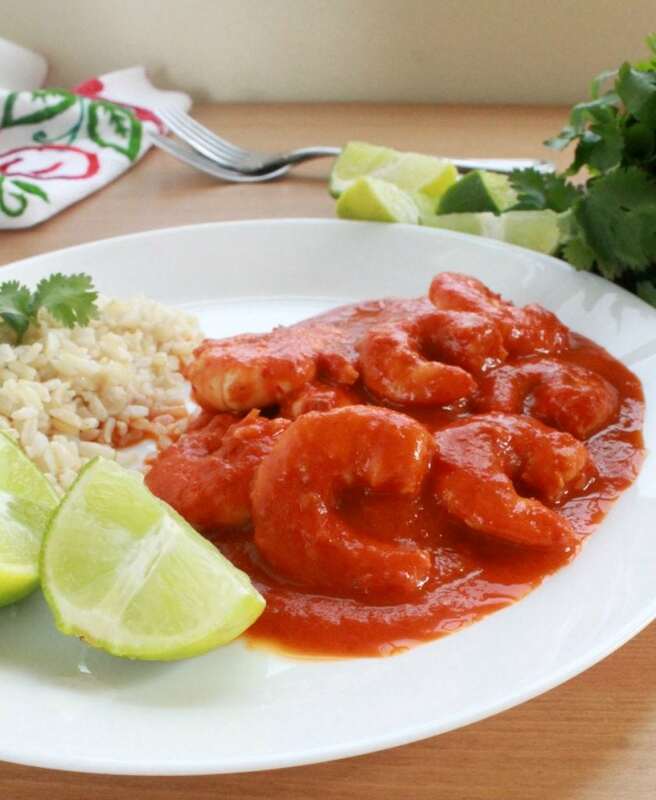 This typical Mexican food recipe is made up of juicy, plump shrimp in a spicy sauce. Ready in under 30 minutes. This is how I was first introduced to Camarones a la Diabla. Many years ago, I worked at a company that serviced a large Mexican population. All of the Spanish-speakers loved talking to me… Hola! I’m Mexican too! One day, one of our amigos brought us some Camarones a la Diabla. It was so spicy. We’re talking 10 plus“call-the-fire-department” heat level! The most important part of making Camarones a la Diabla, or Mexican Deviled Shrimp: check your shrimp! Ask your seafood counter friends at the grocery store when the shrimp came in. If they are thawing out, ask them how long they have been out. Then when you get home, use them right away like THAT night. Food poisoning can happen very easily… UGH! Fresh shrimp can last up to 2 days in the fridge. Overnight in the fridge is the best way to thaw shrimp. Another way is to take the shrimp out of the package and wrapping. Place them in a bowl with cold water. Leave the shrimp in the water for 15 minutes. Some people will place the shrimp in boil water for 1 minute. This will cook them slightly. Know that this will take away from the flavor especially if you are making Camarones Rancheros or Camarones en Crema Chipotle. To make the sauce, you need some guajillo peppers and chile de árbol. These are the same chiles we use to make Camarones al Ajillo. These are dried chiles, and they can be dirty. Don’t rinse them under the water faucet, or they will lose some of their flavor. 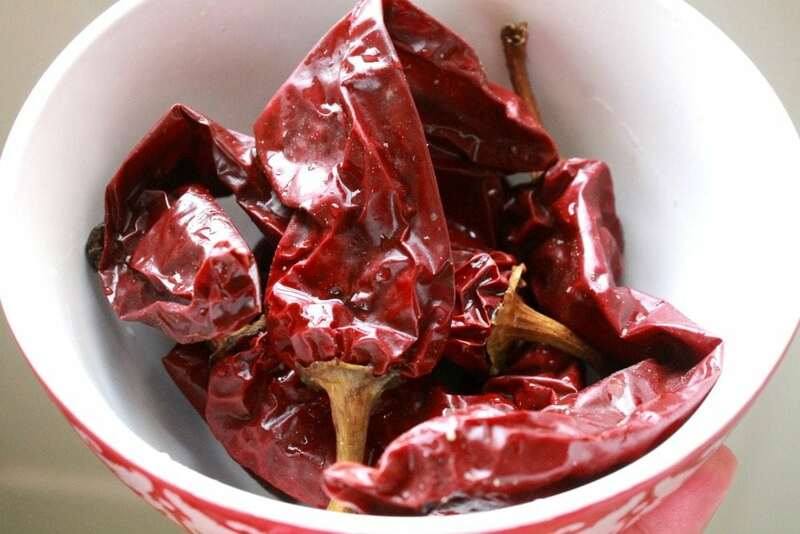 Instead, wipe the dried chiles with a damp paper towel. This is also the same reason why you should not cook with the water used to reconstitute the chiles. 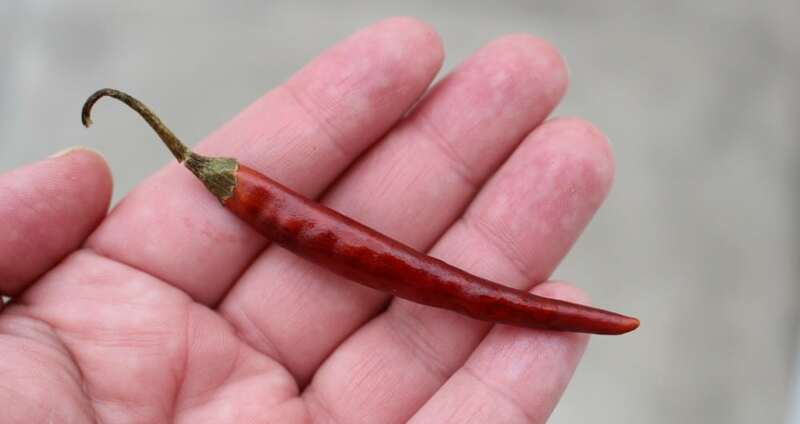 This little, itty bitty chile is called chile de árbol. It is small but potent. • Whatever you do, DO NOT touch your eyes! If you are not used to working with chiles, it can irritate your hands. To avoid this, use gloves. No gloves? No problem. Carefully use plastic wrap, or place your hand inside a plastic sandwich bag to handle the chiles. Dried chiles are prone to insects. Eek! • Keep them fresh and insect free by storing them in an airtight container in your cupboard. • They can last up to a year, but it is better if you use them within three to six months. • It is best to keep them in the freezer. If you do not have room in the freezer, use up the dried chiles as soon as possible. The color of the sauce is very bright red. Some people will strain the sauce for Camarones a la Diabla. Bits the chiles sometimes don’t blend completely. I am not into straining. It has nothing to do with taste or texture. I just don’t want another dish to wash. lol. If I am feeling energetic, though, I’ll strain the sauce. To each their own. Word to the Wise: Taste the sauce before you add it to the shrimp. If it’s too hot, add an extra tomato. Some people will even add ketchup for sweetness. To make this recipe, I suggest the bigger, the better. I used large shrimp. How long will the Camarones a la Diabla Last? 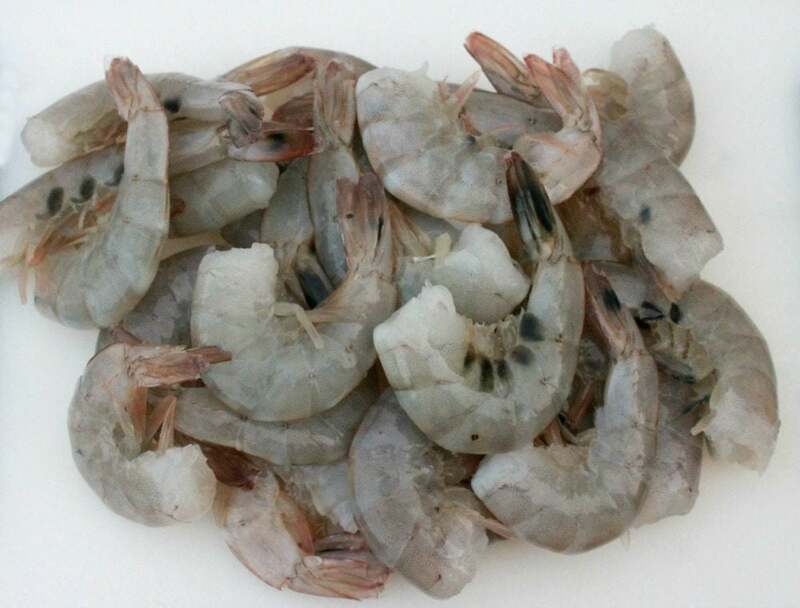 • Cooked shrimp will last 3-4 days in the refrigerator. I do not recommend freezing this dish. It will lose some of its deliciousness. Although, it can be done in a pinch. • On the stove, place in a skillet for 5 minutes on medium heat, or until hot. • In the microwave: Place in a microwave-safe container, and heat for 2 to 2 1/2 minutes. 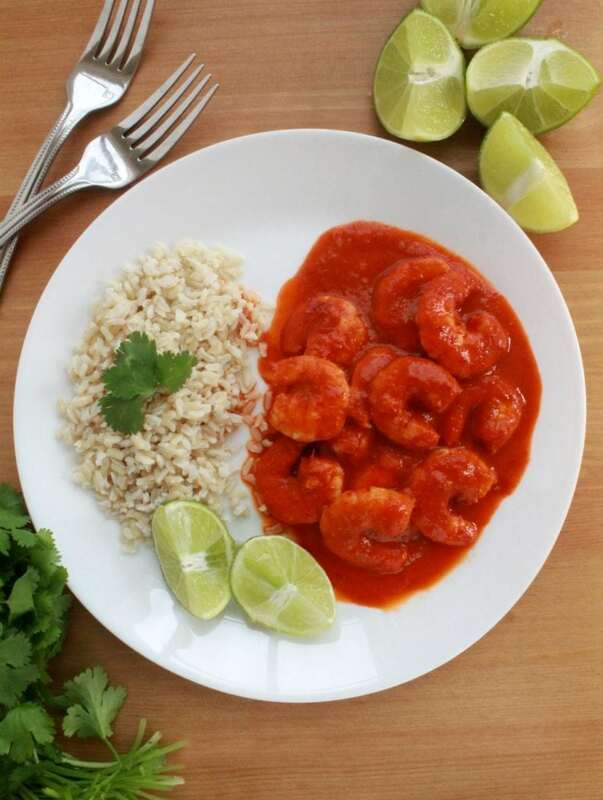 Camarones a la Diabla, or Mexican Deviled Shrimp, is such a great dish! Big, succulent shrimp. YUM! I could seriously eat this every day. Hope you enjoy! Bring to a boil. Turn heat off and let the chiles sit in the hot water for 5 minutes or until the chiles are soft. 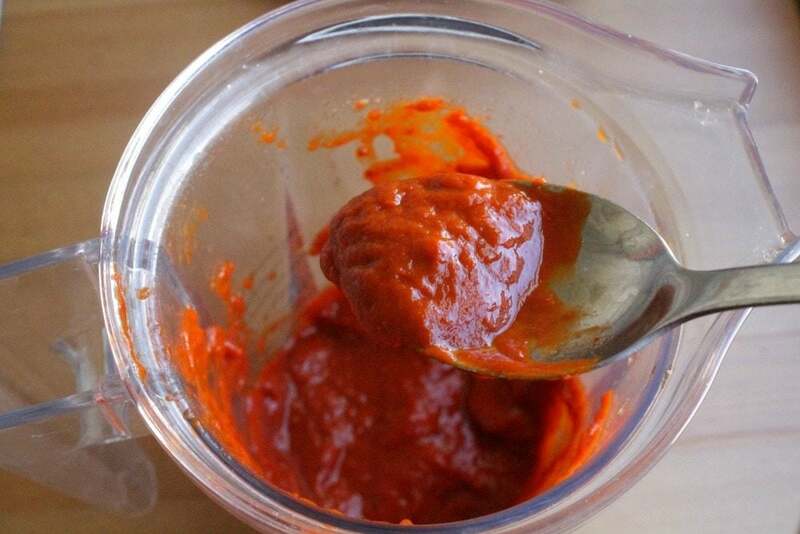 To the blender, add reconstituted chiles, tomatoes, chipotle pepper, ¼ onion, garlic, and salt. Blend until smooth, strain the sauce, and set aside. Add salt and pepper to the shrimp. Add the remaining onion. Stirring constantly for 1 minute. Add the shrimp. Stir constantly and cook for 2 minutes. Do not overcook the shrimp, or they will be rubbery. Make sure the heat is on low and add the tomato chile sauce. Stir and cook for an additional 2-3 minutes. Serve with white rice and lime wedge. 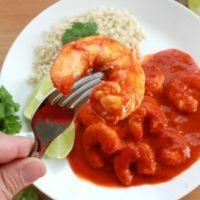 If you are wanting to make this dish less spicy, only use 1 chile de arbol. Hope you do. This dish is delicious! I love any dish with shrimp in it and your dish looks amazing. Maybe this will be my Valentine’s dinner! I love shrimp! I should make this!